What Old Automotive Technology Is New Again? I once had a professor in automotive history (German universities rule) who said that there is no new technology in the automotive world. Everything has been tried before, probably by some obscure French company that built four cars back in 1897. For instance, you would think that automotive charging stations are a very new idea, given how much Tesla talks about their superchargers. In fact General Electric had their own electric "electrants." They were like little fire hydrants or call boxes that electric vehicles could plug into and charge up. GE sold them to central stations and some were set up around major US cities in 1899 . The problem was that there was no standardized plug for EVs back then (just as there isn't now), and Michael Schiffer's Taking Charge states that not even half of the EVs of 1900 could plug into the electrants. 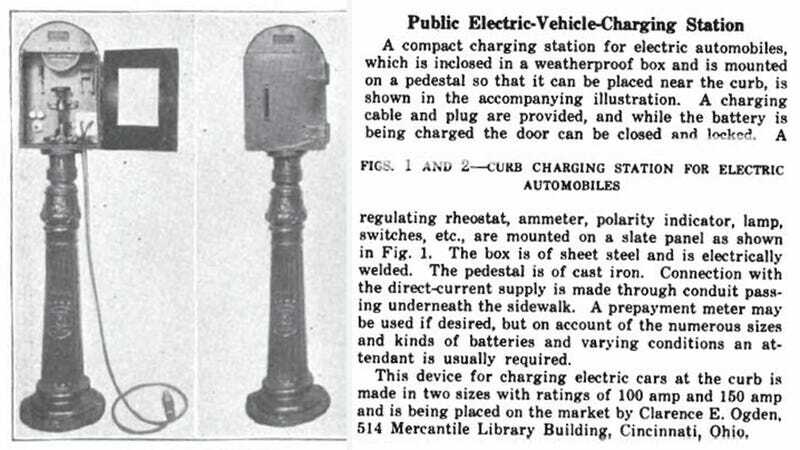 What's funny is that over 110 years later there is still no standard plug for electric cars. By the mid 1910s, GE decided that they weren't successful, so they scrapped the program. Hopefully the same thing doesn't happen to Tesla. What other automotive technology is touted as sparkly fresh and new, when it's really quite old?